What can the mating behavior of birds tell us about evolution, climate change and species survival? For Peter Dunn, UWM distinguished professor of biological sciences, bird-watching offers clues to overarching ecological questions. He wants to know the purpose behind bird preferences such as feather brightness and why some birds follow the same mating playbook, while others deviate. 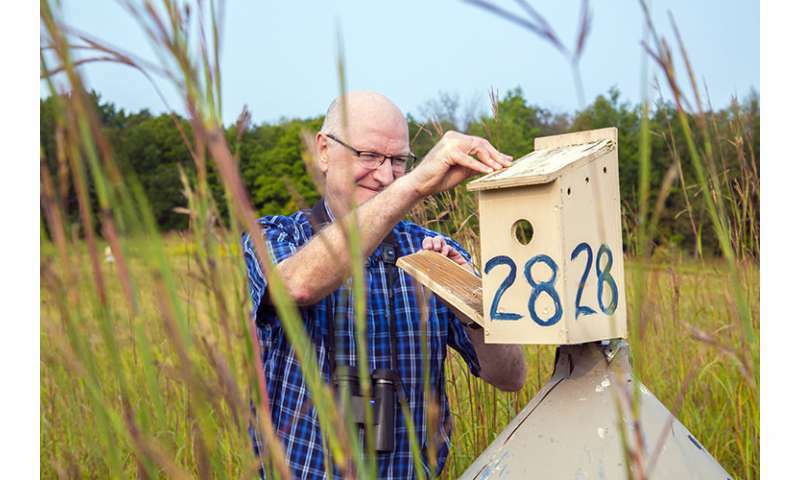 He and Professor Linda Whittingham are now in their 21st year of studying tree swallows at the UWM Field Station, a 320-acre wetland near Saukville. This has given the ornithologists a long-term perspective on the birds they study, which include common yellowthroats and tree swallows. When I first became interested in bird behavior I was drawn in by birds that have a lek mating system, like the greater prairie chicken. In the lek, the males give a public display out in a field, which attracts the females. The males all hang out in this group, just strutting their stuff for the females. Some get multiple mates and other don't get any. It's like a bar scene where the guys are showing off and the females gather to check them out. After mating, the females go off and build a nest and raise the young all by themselves. The males do not provide any parental care. This is unusual. Ninety percent of birds are monogamous and they raise their young together. So, what originally interested me was the question of why are some birds like that and others are not. How do you find and study the other 10 percent? Linda and I have been studying mating behavior in tree swallows since 1997. When they nest, there's a male and a female and they appear to be monogamous. But when we did the genetic analysis, we found out there's actually a lot of fooling around. Genetic analysis of the offspring showed the male tending the nest may not be the parent. He only sires about half the young. The female needs the help of the male to raise the young, but she doesn't necessarily want his genes. In fact, 80 percent of the females have extra partners – that's about the highest rate of any bird in North America! What is luring the females into promiscuity? We did a study just last year where we took magic marker and made some of the males duller. What we found is, if you dull a male, he isn't as attractive to females. So he can't get any of these "extra matings." We showed experimentally that it's really the color of the male that leads to the extra-pair mating. We also found that the extra-pair sires had brighter plumage than the within-pair male they cuckolded. These results suggest that extra-pair mating behavior is driven by reproductive benefits to both males and females. You've done a lot of work on the differences between males' and females' plumage. What else have you found? Why many males and females are different in the brightness of their features has been a perennial question since Darwin. So, in 2015 we did a study, looking at nearly 1,000 species, and we found that, while males often have brighter feathers than females for purposes of attracting a mate, natural selection has been equally important over time in determining feather colors. We correlated the colors with lifestyles and where the birds live. One finding was that evolutionary change has most often led to similar, rather than different, plumage in males and females. Another was the difference between genders is related to mating behavior: In non-monogamous birds, you're more likely to get brighter male plumage. In monogamous pairs the feather coloring is more alike. What are the advantages you've had by using the field station over the years? It's undisturbed, so you can record long-term change, like insect abundance. The wind speed is decreasing over a long period of time and the Field Station data confirms that. The slower wind speed increases the food available to swallows and may be helping their reproduction. That type of study could not be done without undisturbed habitat nearby. 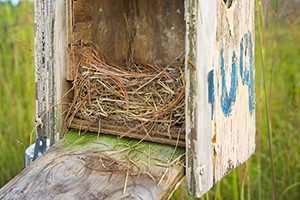 Most of the 80 nesting boxes there are occupied by tree swallows, although there are also some bluebirds and house wrens. It's allowed us to take some data on onset of spring. The swallows have been laying their eggs nine days earlier than in the 1960s. The evolutionary consequences of infidelity: Can extra-pair relationships give rise to sexual dimorphism?